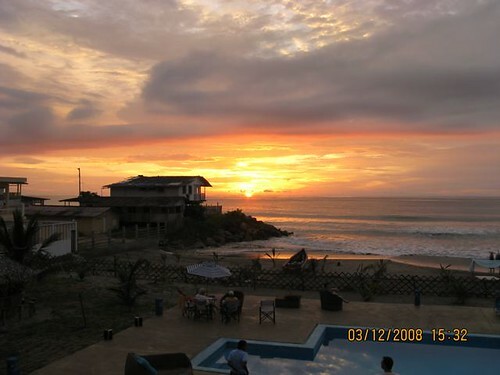 Tag Archive | "Ecuador beaches"
Amy Pinoargote who conducts our Salinas south Ecuador coastal real estate tours just sent details about a great house for sale near Salinas. There are three days left to join our International Club at the 2009 price and save an extra $501. fun. 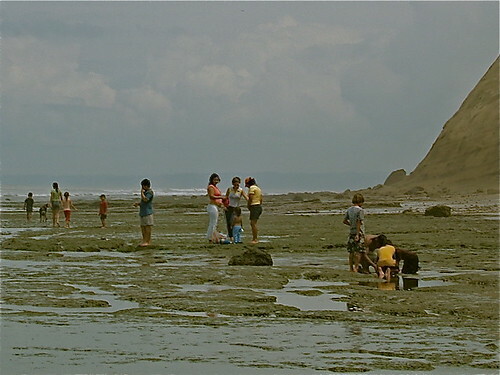 Here is a family playing in Ecuador coastal rock pools at low tide. Sunsets are world class… plus prices remain really low. 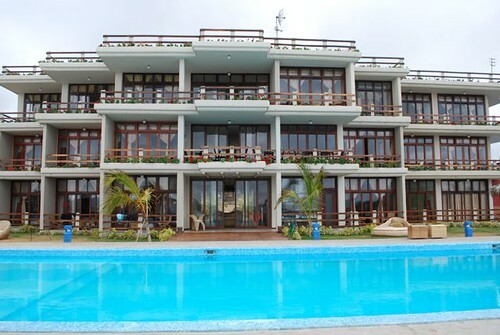 Therefore it is no surprise that our Ecuador each real estate tours are very popular. We have conducted Ecuador mid beach tours for several years and last year tested the first Salinas Ecuador south beach tour. 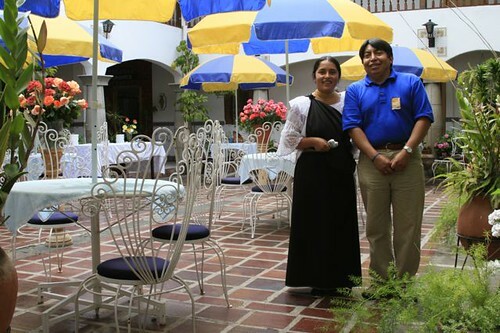 This tour was such a success that we added four Salinas Ecuador hosted by Amy Pinaorgote. 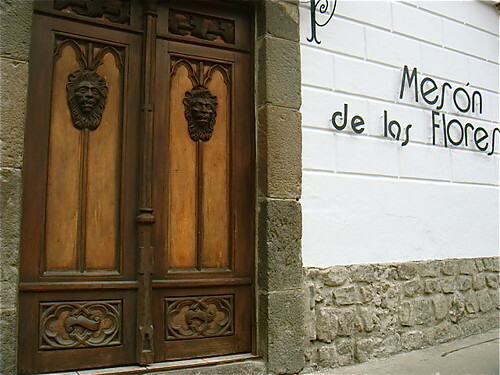 International Club members can attend these tours free. Gerardo and I have been visiting local properties for sale in preparation for the March Salinas Ecuador South Coast Tour and just saw a townhouse I am very excited about. 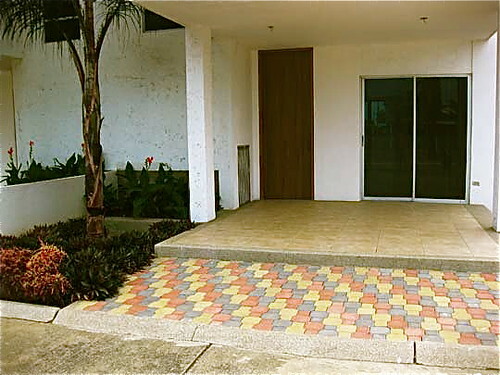 $58,000 Ecuador beach townhouse entrance. This property is located in a quiet development across the street from the beach, near the town of Ballenita, about 10 miles from Salinas. This Salinas area house is a 1,250 square foot townhouse on a 2000 square foot lot. The owner is an Ecuadorian lawyer, who has a weekend home in the same development. He built the townhouse on speculation and has it listed at the incredible price of $58,000. 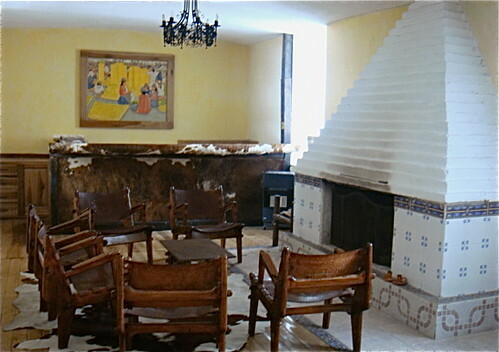 The home has a neutral color scheme, with tile floors throughout. Downstairs it features a living/dining area, with sliding glass doors opening to a large brick patio. 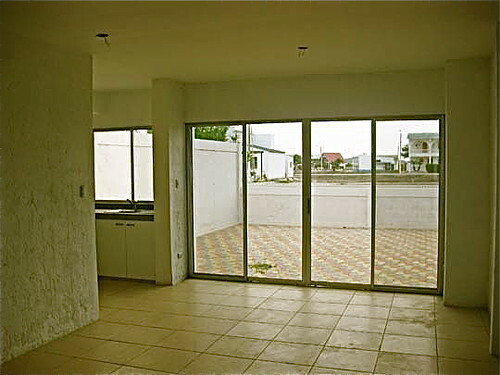 $58,000 Ecuador beach townhouse dining area. The kitchen, a half bath and a nice sized bodega (storage closet) are also located on the ground floor. 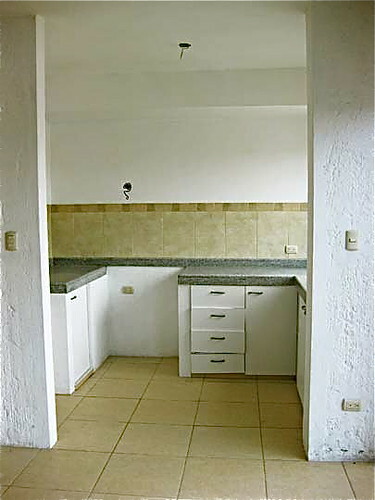 $58,000 Ecuador beach townhouse kitchen. Upstairs are three bedrooms, two full baths and a linen closet. 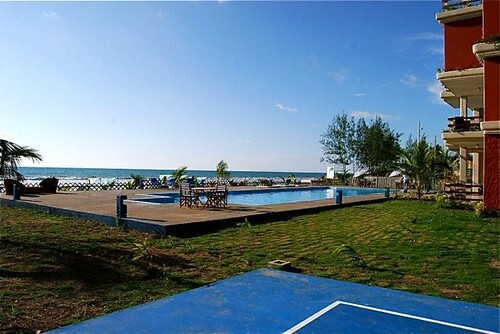 $58,000 Ecuador beach townhouse bedroom. The owner says he built the place with care, as if it were to be his own home. 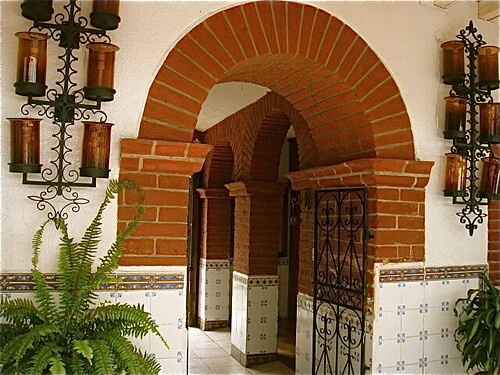 This shows in details like the high wooden ceilings in the bedrooms, the color selection of the bricks in the patio and the design of the curving staircase leading to the 2nd story. 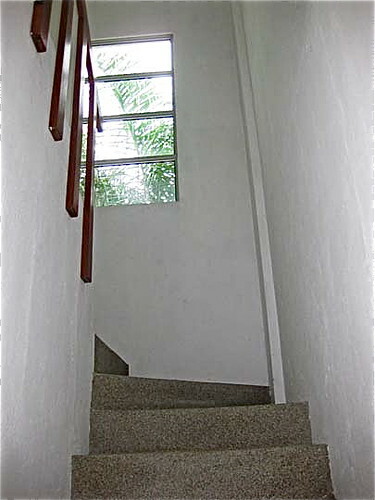 $58,000 Ecuador beach townhouse stairs. 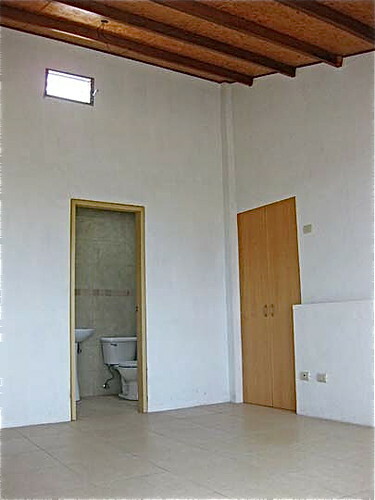 As with most properties in Ecuador, appliances are not included. But bring your furnishings and this place is ready to move in. It has washer hookups, an outside bodega, a nice front patio and hot water piping throughout the home. The latter is not something to take for granted in coastal Ecuador. 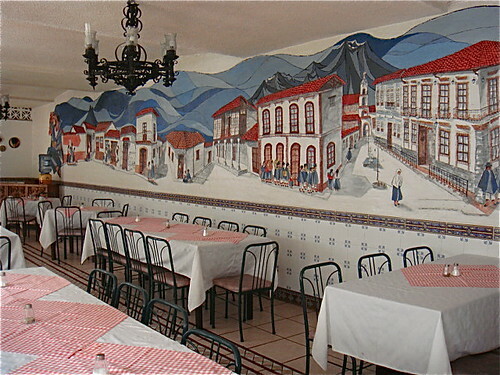 Due to the temperate climate, many homes built primarily for the Ecuadorian market do not have hot water piping. Instead the owners use instant water heaters on the shower heads and cold water throughout the rest of the house. Although the home doesn’t have ocean views, it is just a short walk to the beach. There is even a pedestrian tunnel leading directly out of the complex, so you don’t have to worry about crossing the street. The complex is gated and there is 24 hour security. I can’t promise this property will still be available at the time of our March tour, but if it is we will definitely visit it. In the meantime I will be busy finding other great deals in the Salinas area. P.S. speaking of beach properties in the $50,000 range, there are still two suites left at Spondylus II. Both are located on the 2nd story and have ocean views. The 580 square foot unit is priced at $51,000 and the 650 square foot unit at $56,400. 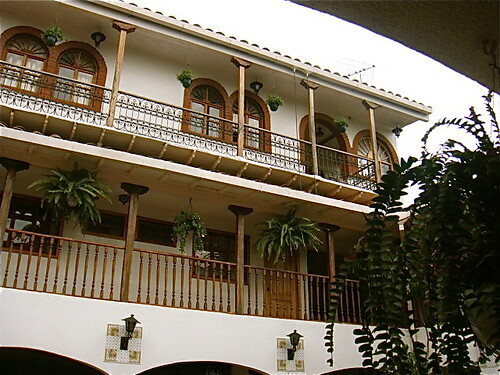 You can get more information about these properties with an Ecuador Living subscription. Join us for the March Florida Ecuador split session. 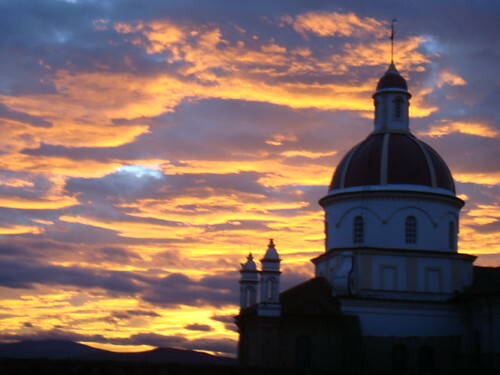 Learn Spanish in Florida… then travel to Ecuador and practice as you view Ecuador real estate across the country.